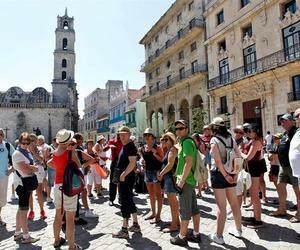 The growing number of international visitors to Cuba, reported at over 3.1 million by the end of October, has sparked predictions of some 4.1 million in 2017. Tourism Ministry marketing director Maria del Carmen Orellana told reporters on Wednesday that the three million 193 thousand and 109 tourist arrivals in October announce a favorable results as the country still expects to receive 175 thousand tourists more than in 2015. Orellana said that among major tourist sources growing this year is Canada despite the difficulties faced in that country due to the devaluation of the Canadian dollar. Other growing markets are the United States, whose citizens can only travel to Cuba under 12 general licenses approved by the Obama administration; European countries, Mexico and Argentina. The official stressed the opening of new air connections by Austrian Airlines, Rusia´s Pegas, and France´s Virgin Atlantic and recalled that US regular flights will now come to Havana, after having opened itineraries to other provinces.